For me, the most exciting opening at Downtown's new ROW complex is no doubt Hayato, Brandon Go's ode to kappo ryori cooking. The place debuted in January, but only serving the Chef's highly curated bento boxes, which are available Wednesdays through Saturdays at $46 an order. Only 16 boxes are prepared a day--all for takeout--and must be paid for in advance. 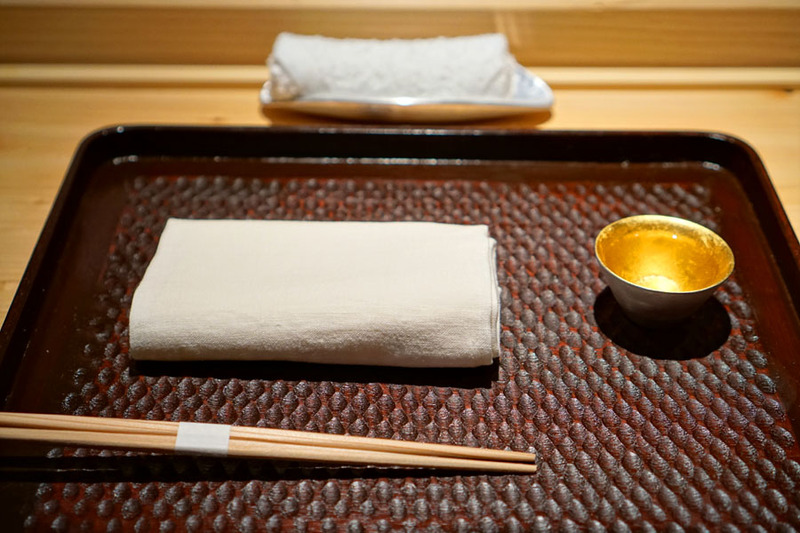 However, we were here for one of Hayato's kaiseki-style dinners, which commenced at the end of July. 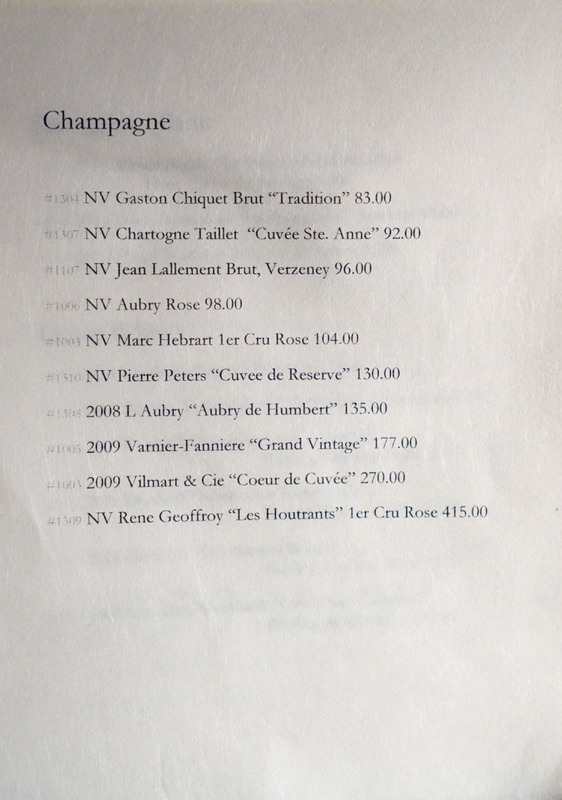 The roughly 10-course menu is priced at $200 a head, not inclusive of tax or a 16% service charge, and requires a $100 pre-paid deposit. 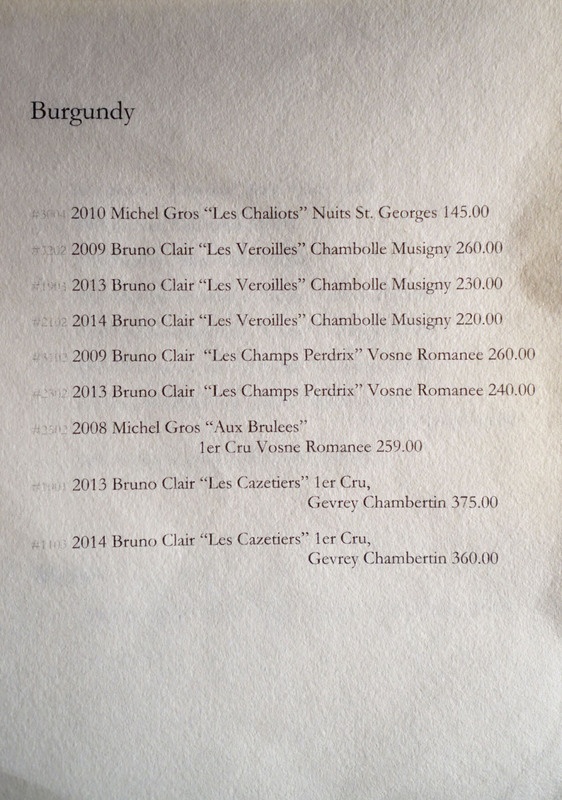 Reservations are available up to four weeks in advance, and there's only one seating a night: 7:00p. About the Chef: Brandon Hayato Go was born in Santa Monica and grew up in the restaurant business. His father Kunio Go owns Koi in Seal Beach, a Japanese eatery that he opened back in 1980, and which has been in continous operation ever since. 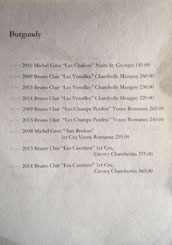 The younger Go began working there in June 1993, when he was just 15 years old. After finishing high school, he went to UCLA and studied biology (mom wanted him to become a doctor), and kept manning the sushi bar throughout his college years. 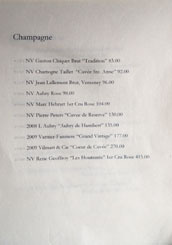 He graduated in 2000, and continued working at the family business, eventually becoming General Manager in 2003. 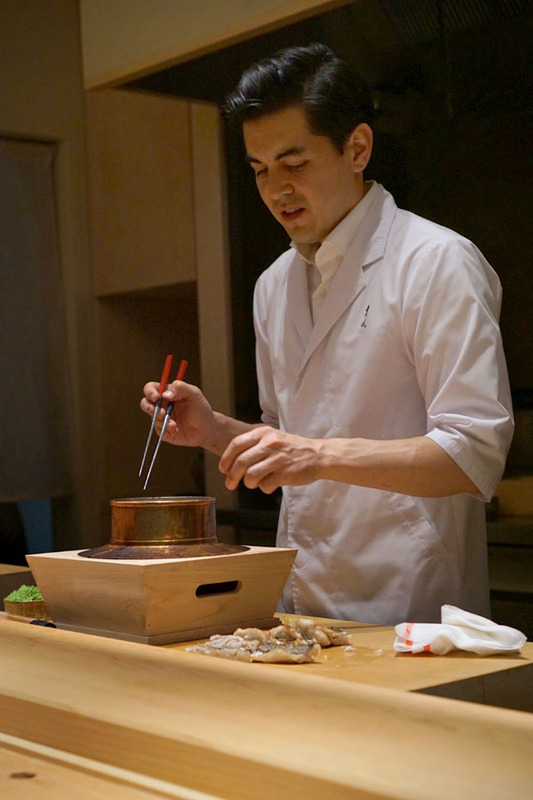 In October that year, Go went to Tokyo and apprenticed at Yakushi Izakaya for four months, where he began to really explore the breadth of Japanese cuisine beyond sushi. 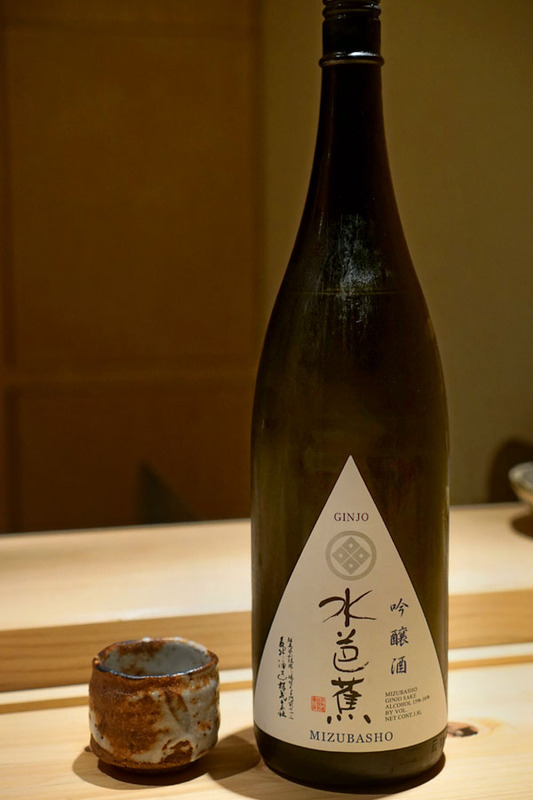 Meanwhile, 2009 saw the Chef gain certifications in sake and soba from the Sake Education Council and the Tsukiji Soba Academy, respectively, all while he still was running Koi. 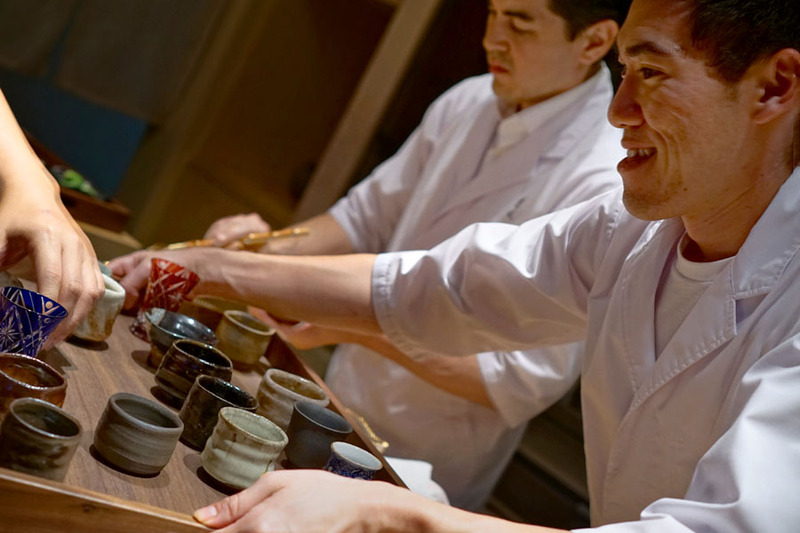 In October 2012, he interned for two months at Shiro in Omotesando under Chef Takeshi Kubo (of the new Goryu Kubo in Nishi-Azabu), who subsequently became an important friend and mentor (Kubo apparently supplied roughly a third of Hayato's tableware). 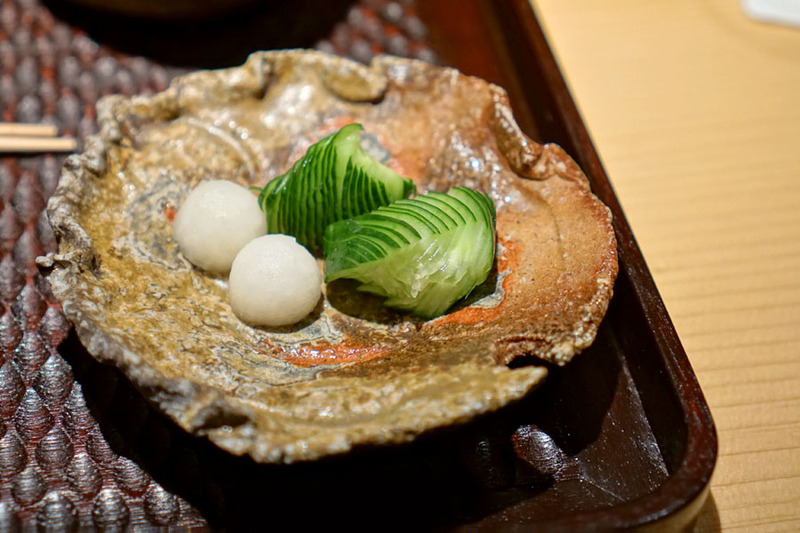 The following May, Go spent five weeks staging at Kagurazaka Ishikawa, under Chef Hideki Ishikawa. He returned for further training in October 2013, March 2014, and December 2016 (for osechi), and was also able to cook at Ishikawa's other restaurants: Kohaku (headed by Kouji Koizumi) and Ren. 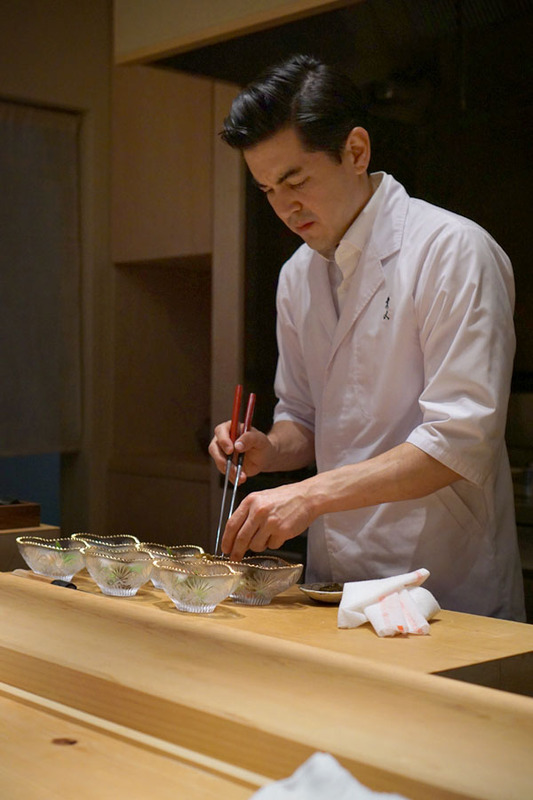 Having worked in Japanese restaurants since his teenage years, Go had always wanted to have his own place, and thus started constructing Hayato at the end of 2016. 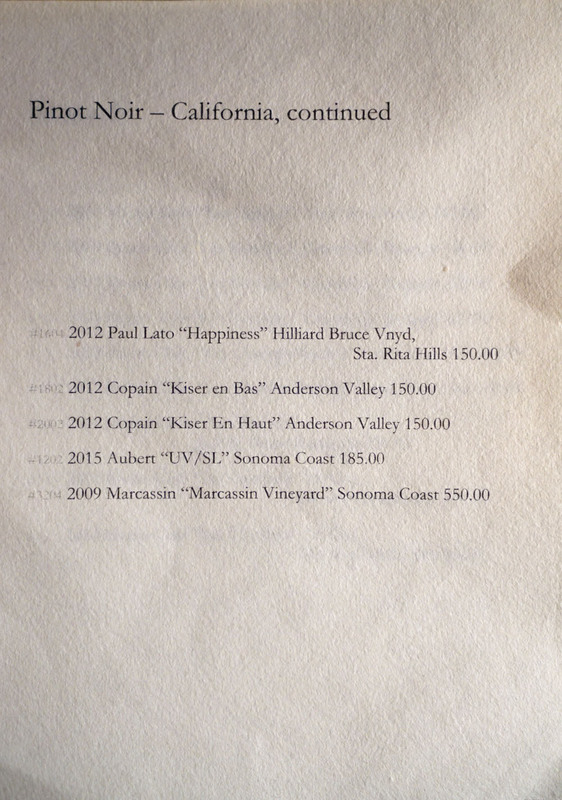 He left his post at Koi in October 2017 in preparation for the restaurant's 2018 opening. Hidden behind koshi latticework is a small space centered on Go's seven-seater Port Orford cedar (the closest we can get to hinoki in the US) counter facing an open kitchen (note the glowing binchotan). There's also a six-person tatami seating area that should be constructed in the coming months. 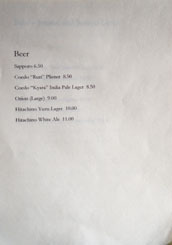 To drink, you get a compact, reasonably-priced sake list, a handful of Japanese beers, and a surprisingly lengthy wine list. 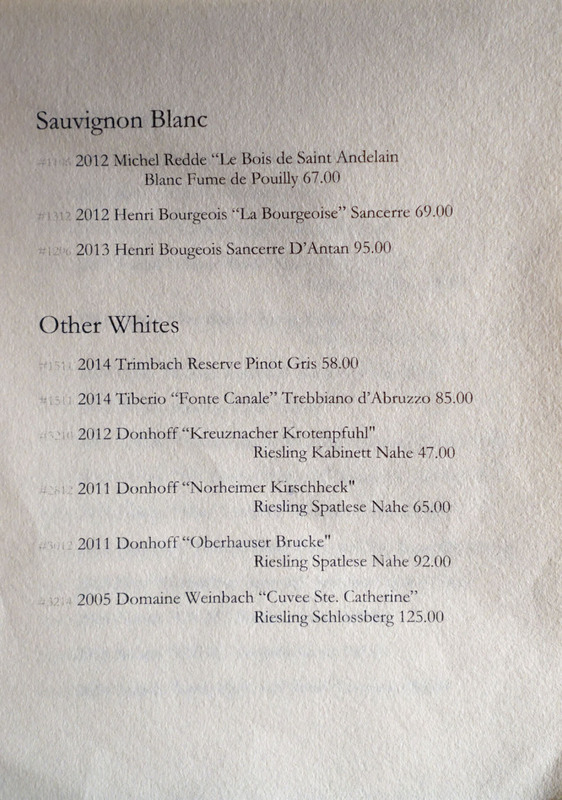 Corkage is $40 a bottle, limit one, and sake is not permitted. Click for larger versions. 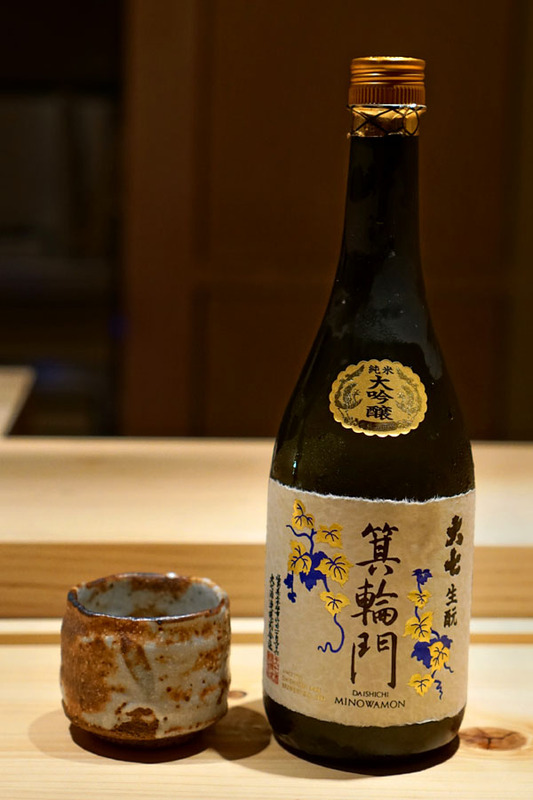 Upon being seated, we were welcomed with some Dassai 39 Junmai Daiginjo, Yamaguchi, served in a surprisingly hefty metallic ochoko. 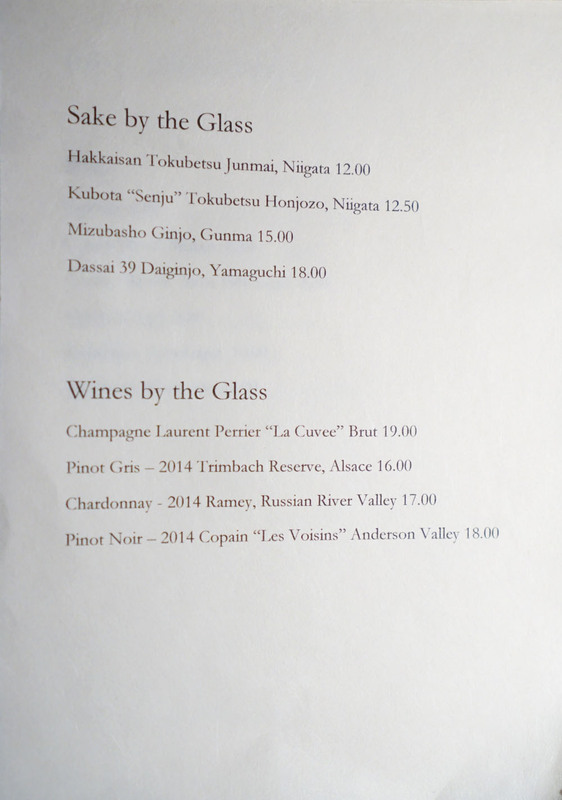 The sake featured aromas that were decidedly sweet, floral, almost candied in fact. Taste-wise, I found it nutty and sweet and soft, with lots of fruit and a touch of alcoholic heat creeping in on the back end. 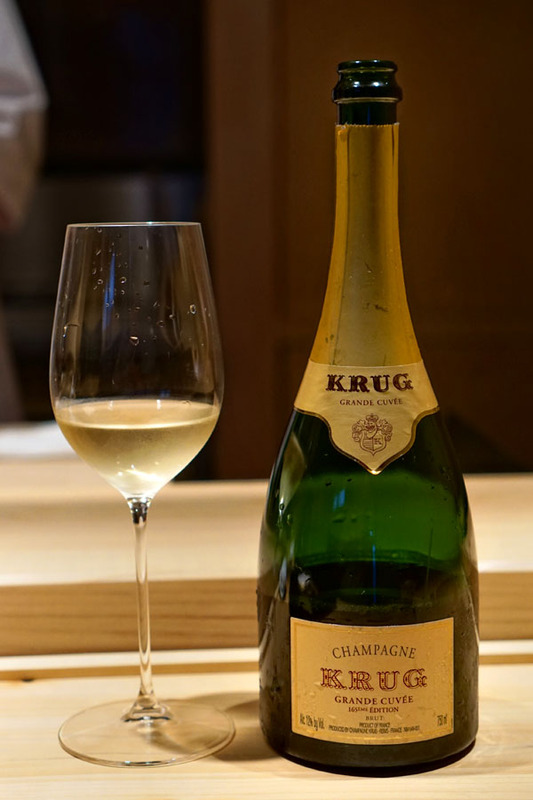 We'd brought along a bottle of NV Krug Champagne Brut Grande Cuvée 165eme Edition, which was based on the 2009 vintage and apparently the smallest batch of the cuvée ever produced. The wine smelled of racy apple and citrus, along with toast, stone, and barnyard in the background. 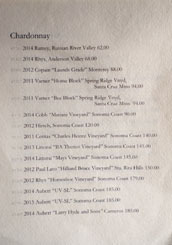 The palate was zesty, vivacious, crisp, almost bracing, and showed off more breadiness, lemon, and green apple peel. 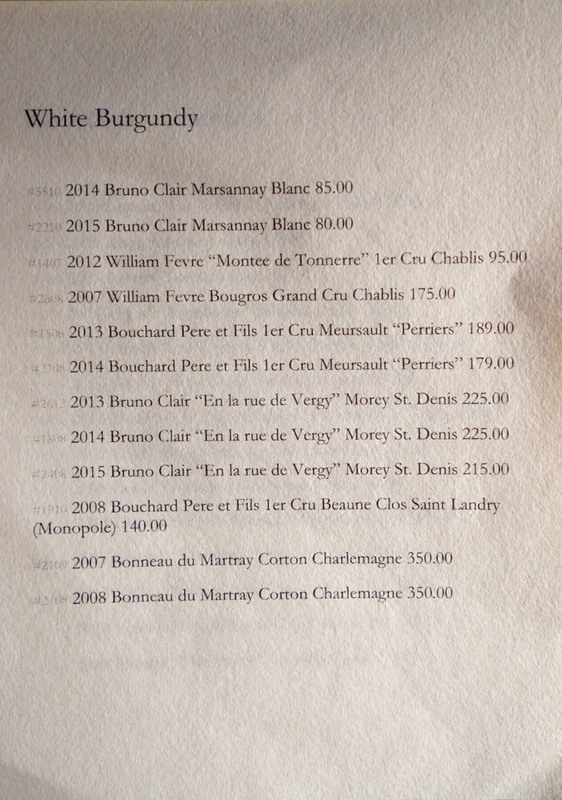 The wine's still young, and has a long life ahead of it. 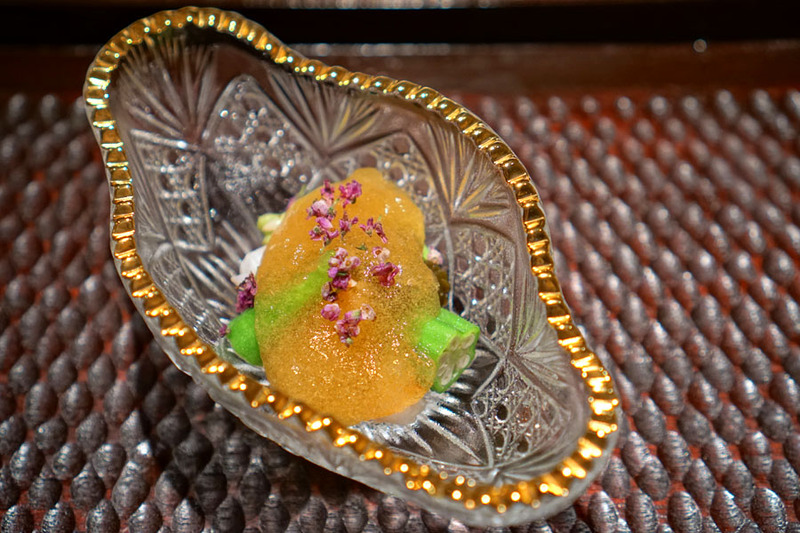 We commenced with the sakizuke course, which featured live Santa Barbara spot prawns, seared rare over binchotan, with okra, mozuku, fava beans, and a tosazu jelly, all garnished with shiso blossoms. It was a strong start to be sure, and I especially appreciated the shrimp's semi-cooked texture, which straddled the line between creamy and crunchy. Taste-wise, I detected a light brine, on top of which was layered the tartness of the rice vinegar and the brightness of the crisp-yet-mucilaginous okra pods and favas, all while the shiso contributed a floral note to the dish. 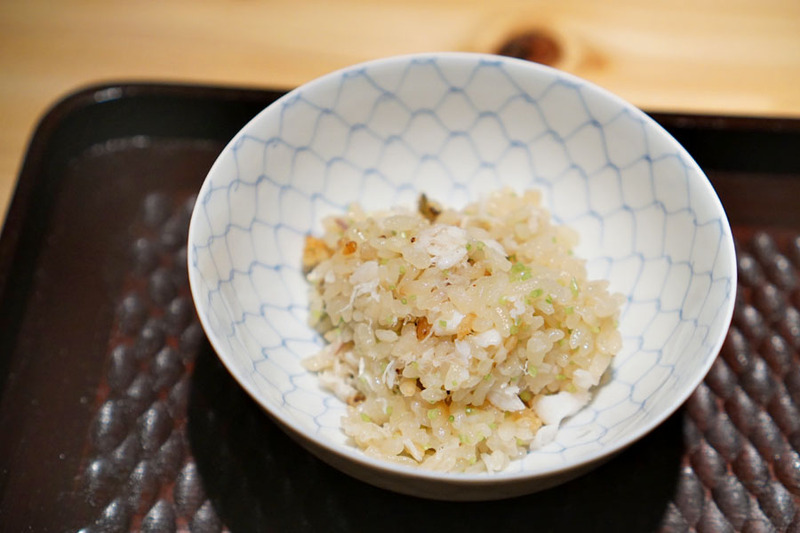 Agemono duties were handled by a light, delicate kakiage of corn, Hokkaido scallop, and mitsuba. 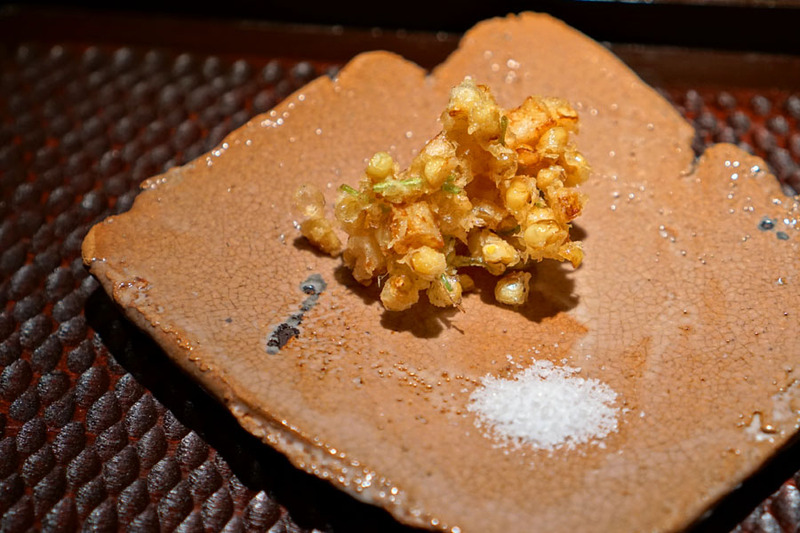 The interplay between the sweet corn and the otherwise savory nature of the course definitely worked here, with the mitsuba serving as a crucial counterpoint. Excellent exclamation point from the salt, too. 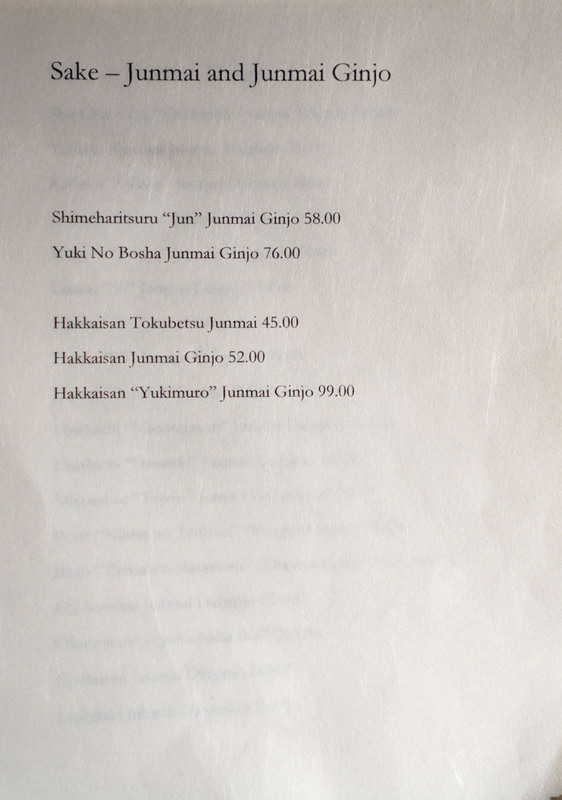 At this point, assistant James (who worked at Mori Sushi for over a year before this) offered us our choice of ochoko. My strategy for choosing sake cups is practical: pick the largest one so I don't have to refill as often. 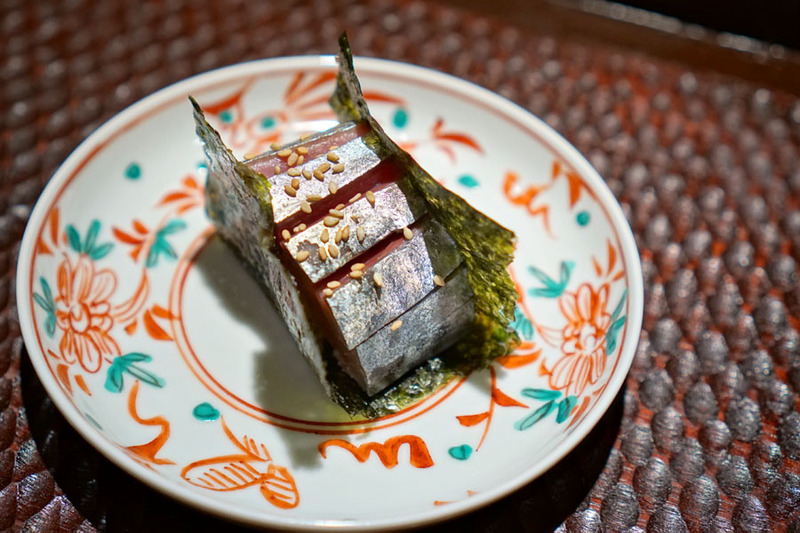 Next came Go's version of Kyoto-style sabazushi, incorporating cured Nagasaki mackerel. The fish was vibrant: super fresh and super clean, with a fine-spun salinity and focused flavors of vinegar perfectly paired with rice, crisp nori seaweed, and the nuttiness of sesame. I'm not sure if I've ever tasted saba quite like this--this was probably one of the most memorable pieces of sushi I've ever had. 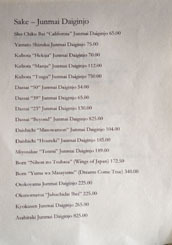 The Daishichi "Minowamon" Junmai Daiginjo [$104] was our next beverage. 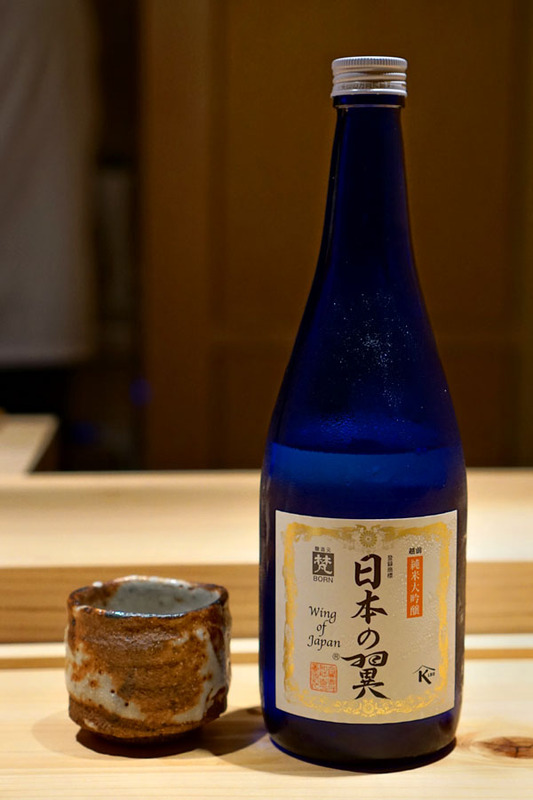 The sake had an intense, heady nose filled with sweet, floral, ricey nuances. On the palate, I found it soft, sweet, and smooth, with creamy, melon-like characteristics and a slightly boozy undertone. 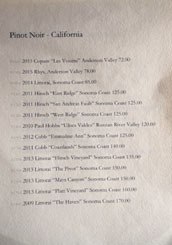 Here was the owan, or lidded course. 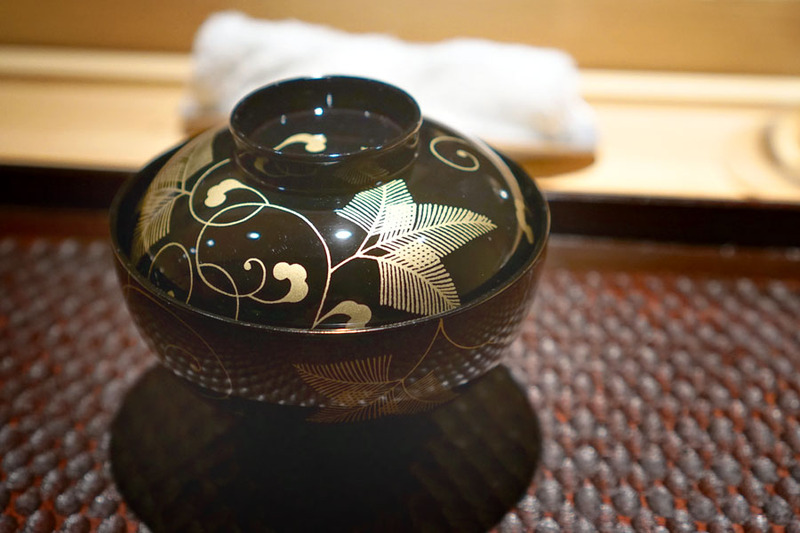 The lacquered bowl contained a suimono (like a very light dashi broth), along with live Dungeness crab and yuzu skin (from the first yuzus they bought for this year). 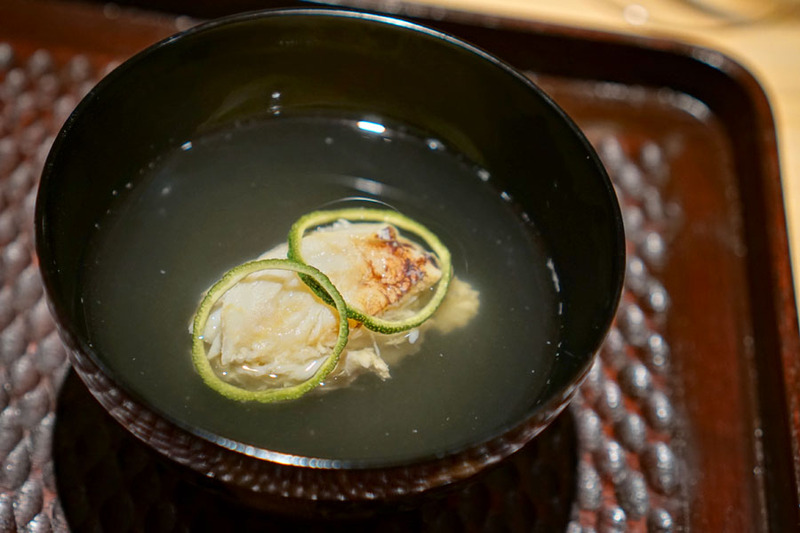 The crab ate sweet, soft, and substantial, and displayed a refined brine that married perfectly with the subtle-but-savory broth, all while the yuzu imparted a wonderful citric sharpness to the mix. This was a favorite of mine, and one of the best Dungeness preparations I've had for sure. 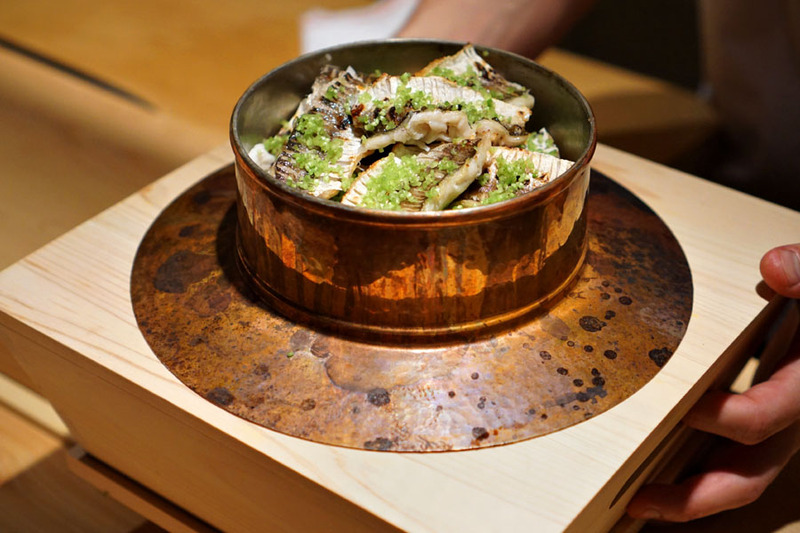 Sea bream from Ibaraki Prefecture was accompanied by myoga, shiso, wasabi (freshly grated on a shark skin oroshigane right in front of us), soy sauce, and salt. The fish was a prime example, coming out clean and creamy, with a soft, subdued flavor profile that really took well to a dab of shoyu and a dollop of the especially intense 'sabi. The salt was an interesting addition as well, as according to the Chef, it's meant for wine drinkers (since it doesn't interfere as much as soy) and tends to draw out more of the flavors of the wasabi. Meanwhile, the myoga worked beautifully as a sort of palate cleanser. 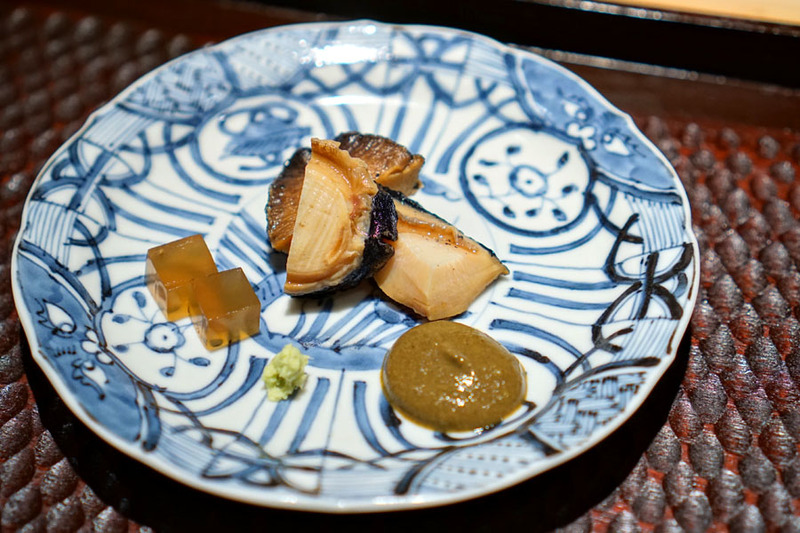 Above we see abalone, steamed in sake, mirin, and soy sauce, accompanied by cubes of abalone stock, wasabi, and a sauce made from the diluted innards of the sea snail. 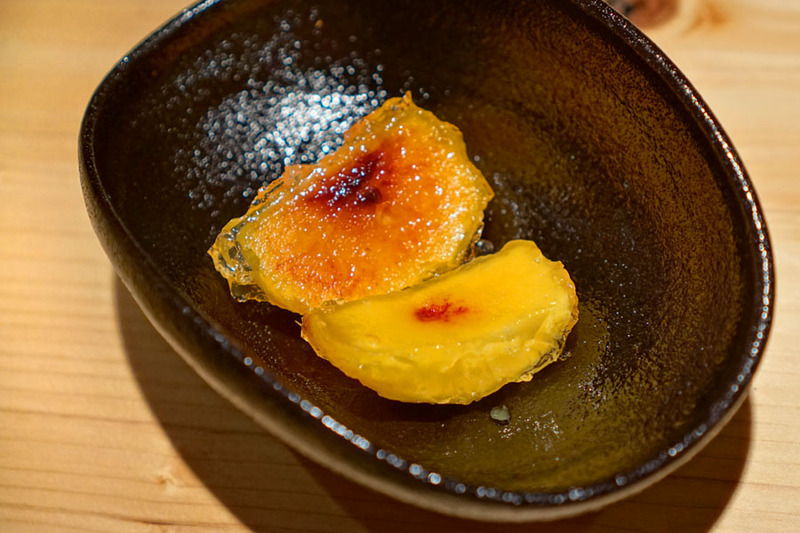 The texture of the awabi was flawless, a mix of pliant and firm, while its taste showed off plenty of umami, which was amplified even further by the solidified stock, all while the innards sauce imparted an additional depth and complexity. 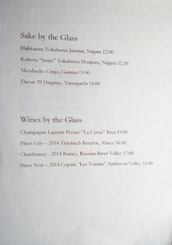 Next to imbibe was a glass of the Mizubasho Ginjo, Gunma [$15], served from a magnum. 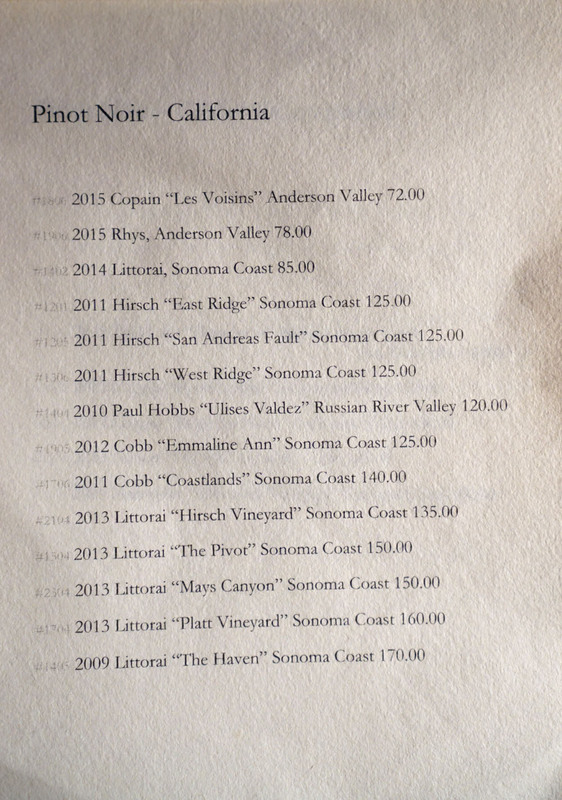 Aromas here were relatively mild; I got a tropical sweetness commingled with wood and funk. 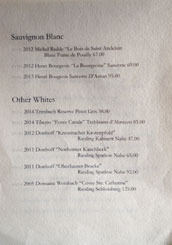 The taste had more of those rustic, earthy notes, as well as more fruit, salinity, and a light alcoholic burn. 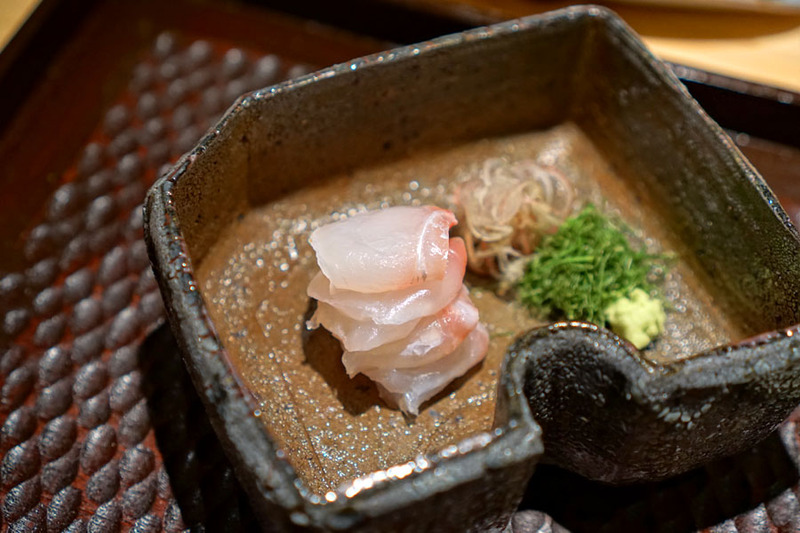 The yakimono course comprised blackthroat seaperch, which I'd had raw and seared before, but never fully cooked. Chef Go believes that grilling the fish is the way to go, and he was right on the money. The akamutsu (another name for it) was wonderfully flaky and light (almost crab-like, I thought), but also fatty and rich at the same time, with an intensity that matched flawlessly with the char and smoke present. 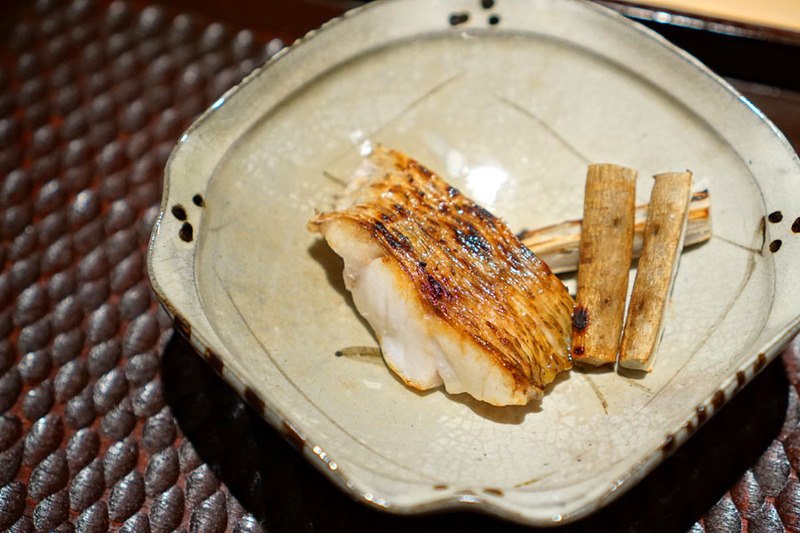 On the side, meanwhile, were cuts of grilled gobo (burdock) with a bit of soy sauce. One of my dining companions commented that this was the best piece of grilled fish he'd ever eaten. I think I may have to agree with him. 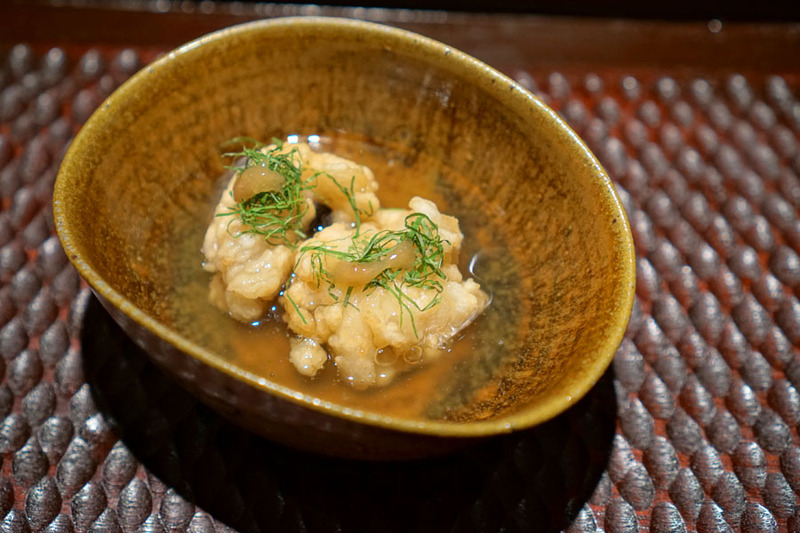 Karaage of pike conger was set in gin-ankake (thickened dashi with light soy and sake) and topped with shiso and the traditional accoutrement of ume. The eel was a delight texturally, and I found the small shards of bone present especially intriguing (the fish has many small bones that are impossible to completely remove, so they must be chopped up using a special hamokiri knife). Taste-wise, the hamo conveyed a subdued-yet-satisfying savoriness that matched up well with the piquancy of the plum sauce. 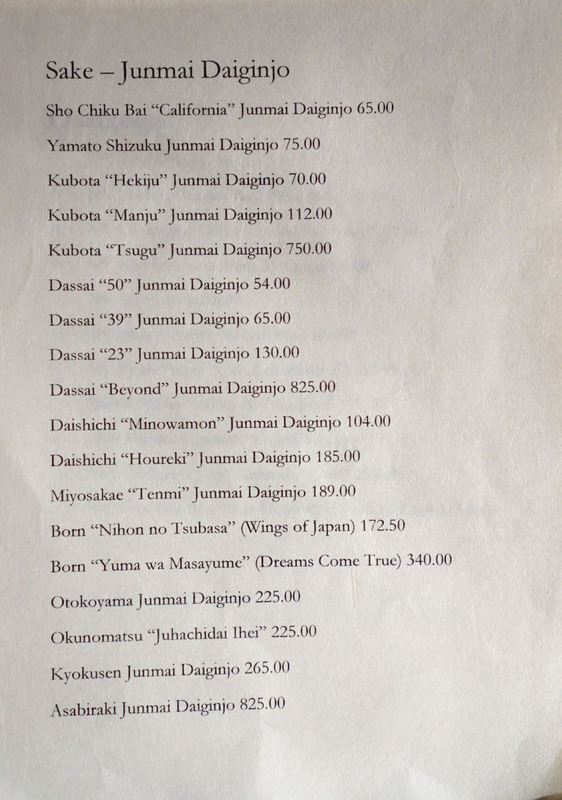 Our final sake was the Born "Nihon no Tsubasa" (Wing of Japan) [$172.50]. 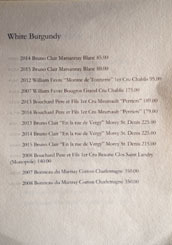 It had a dainty nose displaying flowers, some red fruit, and a savory, almost "meaty" quality. Taste-wise, I found it soft, with a marked fruitiness, a mature complexity, and a touch of heat on the finish. 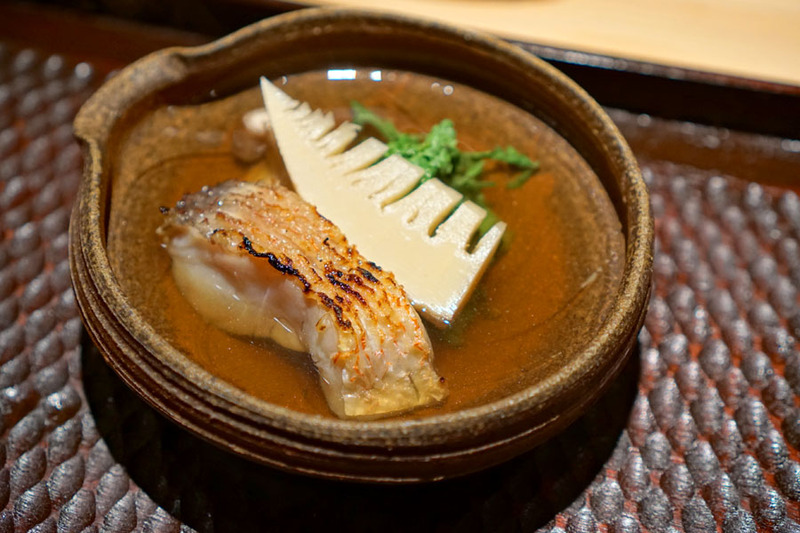 Prized in Kyoto cookery, red amadai was served with bamboo shoots, chrysanthemum greens, and shiitakes, all cooked in the dish's dashi broth (which was simmered longer to draw out more flavor). The fish was properly flaky and very clean tasting, a harmonious blend of finesse and potency, and I especially appreciated the tanginess of those greens, too. Our final savory course was a kamameshi of barracuda, which made for a superb end to the meal. I loved the salinity of the fish here, and how that meshed with the zippiness of mitsuba, the rice serving as a homey base to it all. And yes, we ate the whole thing (I think I took down four bowls just by myself). 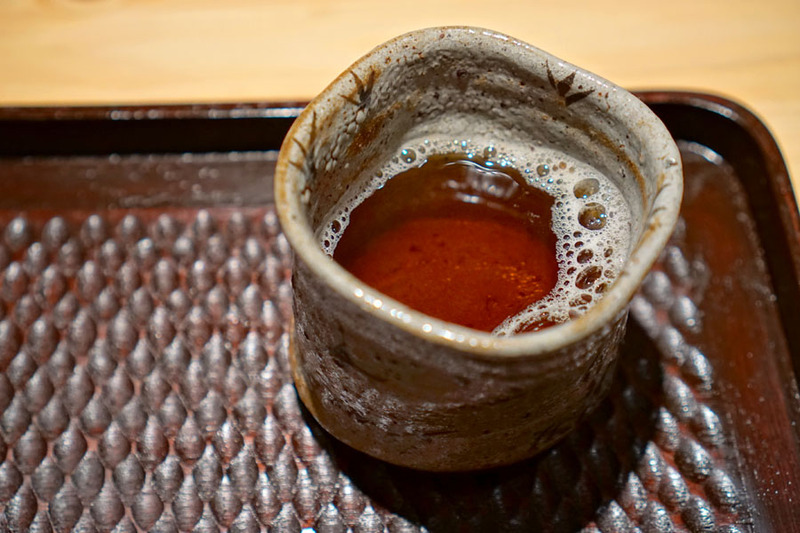 Along with the kamameshi came a cup of bitter, roasty hojicha. 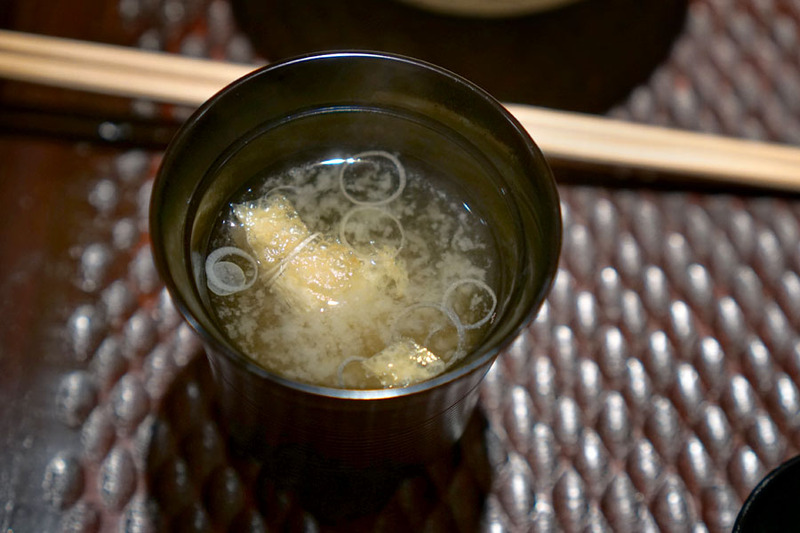 Further kamameshi accompaniments included tsukemono (pickles) and a hearty, cozy miso soup. 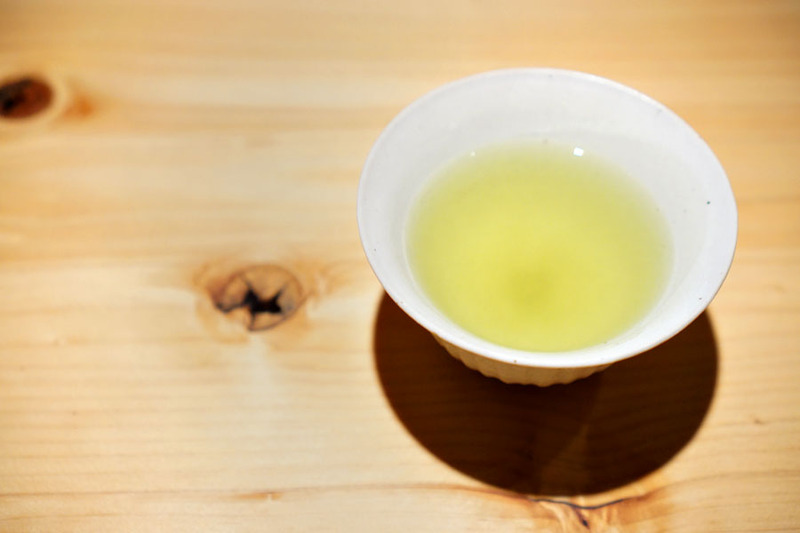 A cup of sencha marked the arrival of dessert. 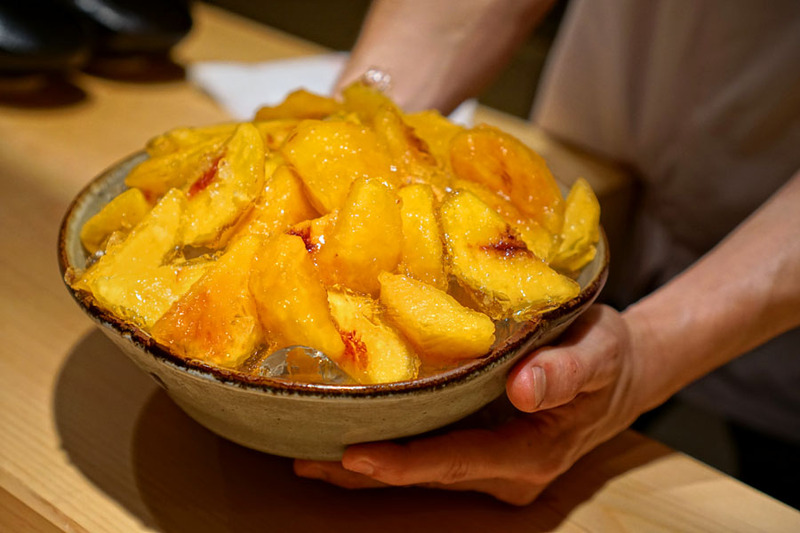 For dessert, the Chef brought out a heaping bowl of Blossom Bluff Orchards peaches encased in sake jelly. Think sweet and tart and juicy and utterly refreshing. Yum. 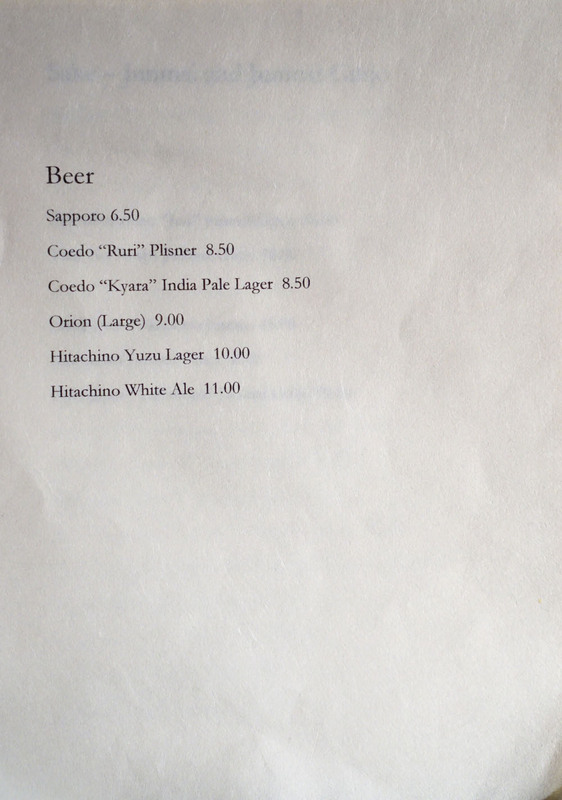 With our sake all drunk up, we moved on to a couple beers to close out the evening. 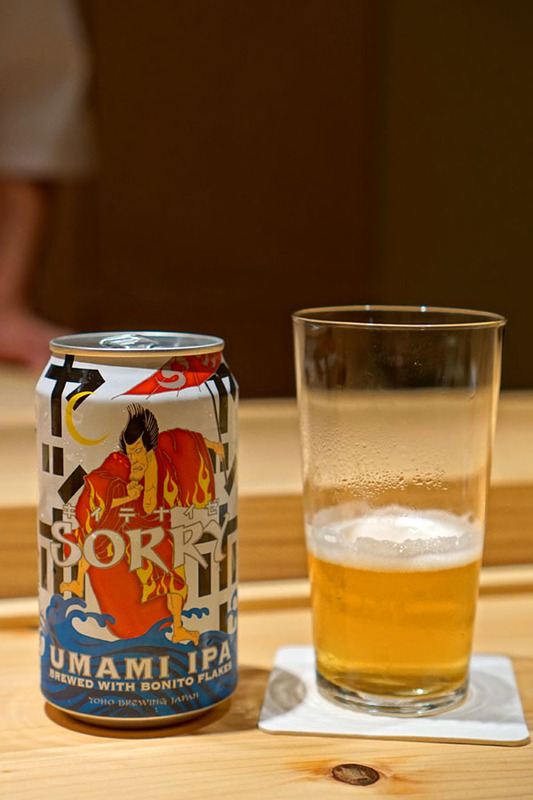 Our first was the Yo-Ho Sorry Umami IPA [$10], which is brewed with bonito flakes. I really didn't taste much from the katsuobushi though (it was slightly more apparent on the nose). Instead, I found the beer zippy and herbaceous, with a floral bent and clear notes of citrus. 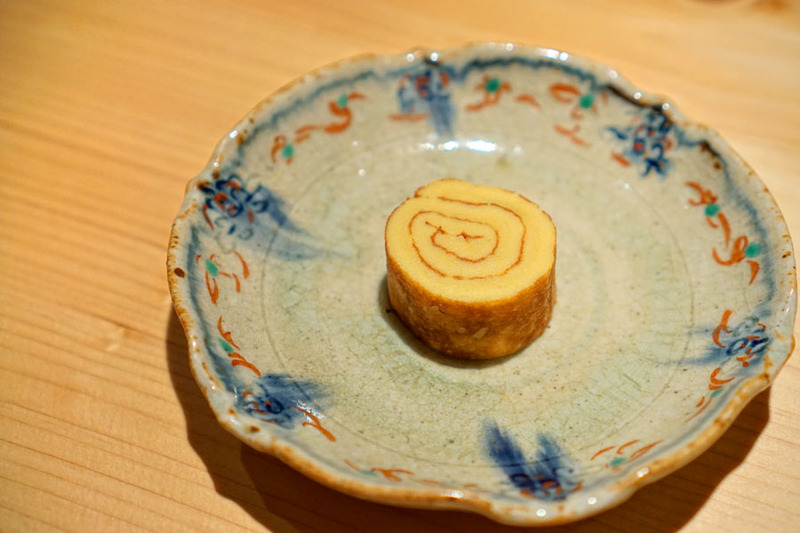 We were given a bonus course of sweet, briny tamago, which is typically included in Hayato's bentos. 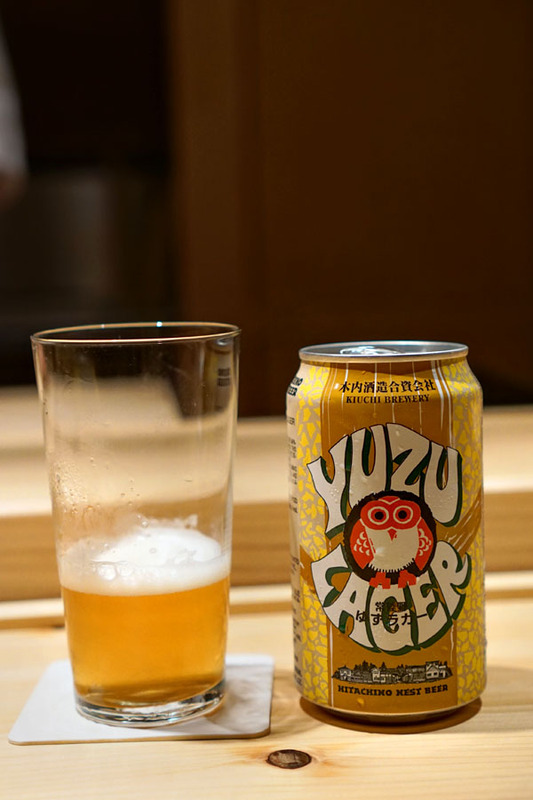 Last up was the Kiuchi Hitachino Nest Yuzu Lager [$10], which I'll say definitely wasn't shy about the yuzu. An invigorating finish to the night. 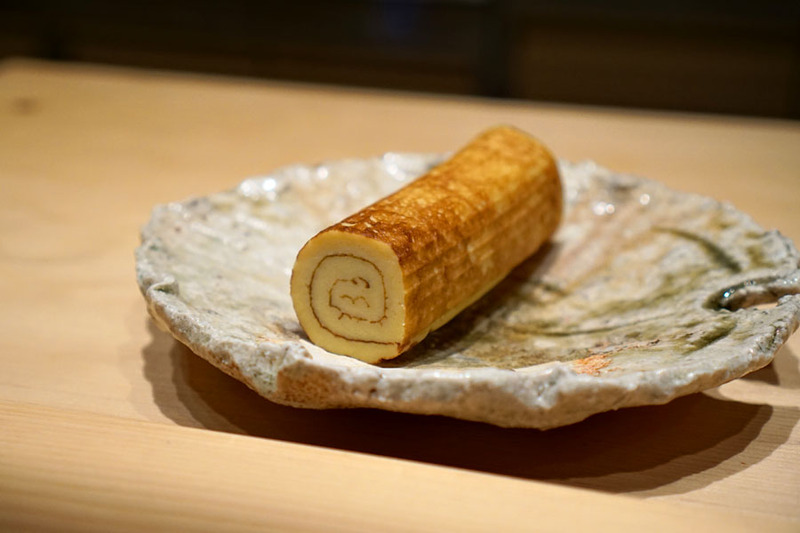 Hayato is an exceptional additional to the LA dining scene, and the meal tonight was surely one of my best of 2018. There's a purity to the cooking here. The food isn't showy or particularly groundbreaking, but rather, the precision and polish involved is what should get you eager and excited. Go's ingredients are top notch, and he lets them "do the work" so to speak, with relatively minimal manipulation, which results in a certain clarity, a robustness of flavor, a complexity derived from simplicity if you will. This is refreshingly "old school" stuff, real-deal washoku cooking that you don't see all that often, so I'm hoping Angelenos will respond positively to it. Dang! Agreed with the user above. It really escalates with drinks needed. looks so good! thanks for putting the place on the radar. I've been a reader of yours for years now and finally moved to LA, so I'm excited to be able to see restaurant openings first hand through your reviews! Loved it. Can't wait to go back again. 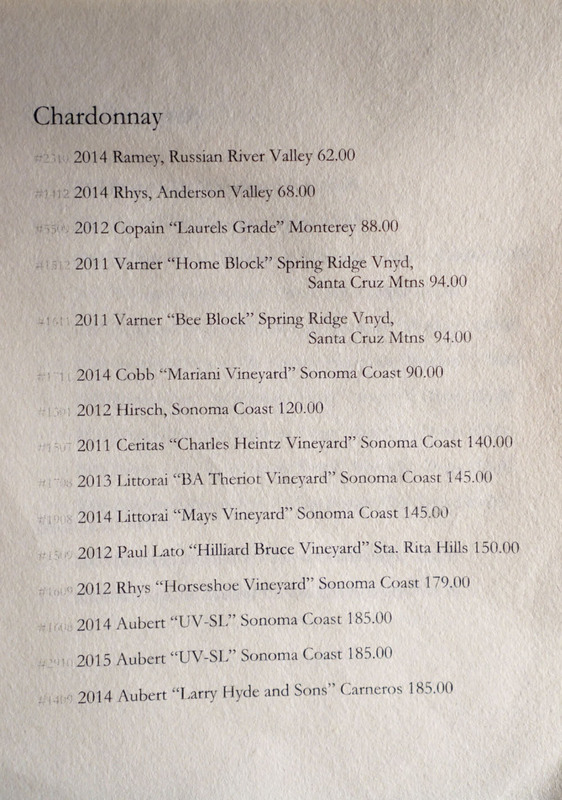 Anon/Mike: That's $15 *a glass*, not bottle. 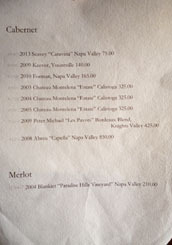 Cindy: Nice--this place should be near the top of your list if you're into this style of cooking. 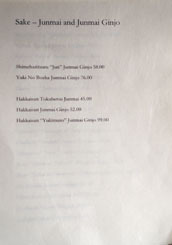 these days kaiseki cuisine can be a bit boring and processional for me. was this the case here or did chef hayato keep things fun? also, have you tried the bento?